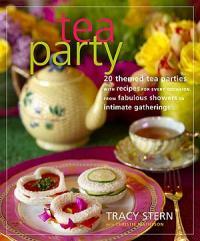 Are you looking for great ideas for a tea party? Tracy Stern brings modern elegance, ideas and style to a classic tradition. Her new book, Tea Party: 20 Themed Tea Parties with Recipes for Every Occasion, from Fabulous Showers to Intimate Gatherings shares themes, recipes and brings the history of tea to life for a new generation. She took time out of her busy schedule to share some of her knowledge about teas, providing tips and suggestions about creating your own tea party. LoveToKnow (LTK): Your creativity with tea and products has led to some interesting tea party ideas. What inspired you to be so passionate about tea? Tracy Stern (TS): I became fascinated with the ritual of afternoon tea while traveling in Europe as a young girl with my family. It seemed so elegant and beautiful, and I loved the delicate teacups, dainty sugar bowls, and the sweets that accompanied tea. Some children collect dolls or model trains but after being exposed to the wonders of tea, I started collecting teacups. During my junior year abroad in college, I would treat myself to tea in France's fabulous tea salons. I learned more about the rituals and traditions associated with tea, and about the intellectuals and artists who used to come together over tea to talk for hours. Of course, I also loved the attention to detail, the beautiful china and linens, the careful table settings, the flowers, and the tasty and pretty treats. LTK: Where does the tradition of tea parties come from? TS: Tea has been a part of cultures all over the world for hundreds, and in some cases, thousands of years. Tea has a long history of being associated with the finer things. In many cultures, it was a cherished (and expensive) treat available only to the upper echelon of society, who would savor every sip and serve it in their best cups. These days, it's much more affordable, but vestiges of extravagant associations remain. LTK: What are some basic things you need to know to host your own tea party? TS: Here are a few. Calm the host with an organized plan (menu, color/theme/décor, invitations, music, guest list, goody bags/gifts, setting). Invitations: Whether it's a hat party or all white party, make sure to include the theme on the invites so guests have an idea. Food: Select food items that are simple and can be pre-made. Décor: Theme is everything, even if it's a color. 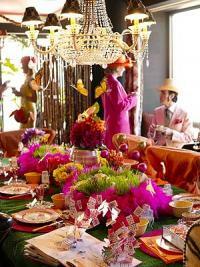 Setting the table: Make it colorful and fun, something unusual and creative. Music: Utilize CDs, iPod, a high school cello player, piano, harp, or DJ. Beverages: Create a signature drink for guests. (Always have champagne with festive accents on hand such as pomegranate or peach juice - colored sugar, and chopped up tea leaves to decorate the rim.) For an added touch, you can float rose petals in the drink. Party favors: These provide a great way for guests to remember the fun they had. Guest list: Invite an eclectic and fun mix of people; guests will meet new people. Entertainment: Consider a tea leaf reader, fortune teller, palm reader, tarot card reader, or florist. Pictures: Have on hand a Polaroid camera, disposable cameras or photo booth rental for an over-the-top addition. Let your guests be the paparazzi! They dressed up, and now you can send the photos with their thank-you notes. Thank you notes: Send them to each guest after the party along with photo. LTK: What kinds of foods and snacks are good to serve with tea? This is perhaps the most classic of tea sandwiches. Although it's simple, it's surprisingly delicious. Vary this basic recipe by replacing the mint with dill, thinly sliced radish, watercress, or shredded carrot. Instead of butter, you could spread a thin layer of mayonnaise, cream cheese, or goat cheese. Sprinkle the cucumber slices with salt and pepper and set aside in a colander for 10 minutes so any excess liquid can drain. Pat dry with paper towels. Using a cookie cutter, cut two 2-inch rounds from each slice of white bread. Coat each circle on one side with a very thin layer of butter. Layer cucumber slices on top of the buttered side of 16 bread rounds. Add a tiny dab of butter and top with a mint leaf. Place another bread round on top, butter side down, and press the sandwiches together gently. Serve immediately or refrigerate, wrapped in plastic, until ready to serve or for up to 3 hours. You could simply flavor pancakes with cinnamon, but chai tea gives a more complex and special flavor. Whisk together the flour, 2 tablespoons of the sugar, the baking powder, and salt in a large bowl. Add the buttermilk, egg yolks, and vanilla and whisk until smooth. The batter should be nice and thick. Use an electric mixer to beat the egg whites until soft peaks form. Add the remaining 1 tablespoon sugar to the egg whites and beat until stiff but not dry. Fold the egg whites into the batter and then fold in the ground tea. Spray a griddle or a large heavy skillet with cooking spray (keeping the spray on hand for when your surface starts to stick). Heat over medium-low heat. Working in batches, pour the batter, about 3 tablespoons at a time, onto your griddle or skillet. Cook until the pancakes are golden brown, 2 to 3 minutes per side. Transfer to warmed plates. Serve, topped with syrup, yogurt and granola, if using, and Chai Candied Almonds. This simple and delicious Asian-flavored dressing can be made in advance and stored in the refrigerator for up to a week. Combine the lime juice, sesame oil, sesame seeds, soy sauce, ginger, and tea leaves in a small bowl. Whisk the oil into the mixture until it's well blended. LTK: Music can set the mood and ambiance of a party. What type of music is appropriate to play at a tea party? TS: Anything that goes with the theme is best. For a Mad Hatter Tea Party, I recommend the soundtrack from Walt Disney¹s Fantasia, as it sets the right mood for this party. For the Summer Picnic, I recommend a portable CD player playing compilation of Japanese music or the soundtrack from Lost in Translation. LTK: A tea party is generally more popular with women. Is there a theme or some ideas for a tea party that are more appropriate for a crowd of men? TS: In Tea Party, I created a Gentleman¹s Tea. Tea parties aren't just for the ladies! You can host a tea for your father, brother, husband, boyfriend, or good friend. The setting should be classic, the décor should be reminiscent of an old-school gentlemen's club (perhaps with plaid accents or images from British hunt scenes), and the food should appeal to a manly but refined palate. This could be a late lunch (complete with martinis and scotch) or an early cocktail party. LTK: The herbs used in teas provide a lot of good health benefits. Tell us about some of your fabulous tea-infused products. TS: I created a beauty line called BEAUTEA, which combines the health benefits of tea for skin. Tea is a potent source of antioxidants, which have been proven to combat a variety of cellular damage, from the aging of skin cells to the deterioration of brain cells, by neutralizing the free radicals that cause so much damage to our bodies. For more information about Tracy Stern and her fabulous tea products, check out her websites Tracy Stern SALONTEA and Tracy Stern Tea Couture.